Cats like their predecessors, lions, wild cats and all animal of the cat family all have something in common, they love to look around. It is usually with the intention of keeping their territory, hunting for prey or just for the sake of pleasure. That is why they have a unique eye design that even allows them to see clearly at night. For such an intrinsic habit, since there are no high mountains or ledges in your living room, your cat needs the best cat window perch to survey his surroundings. You may wonder which cat window perch will be ideal for your cat. There are various designs, materials, and numerous options which can become confusing to pick one. You may not even have a window in your house and still, want one for your cat. 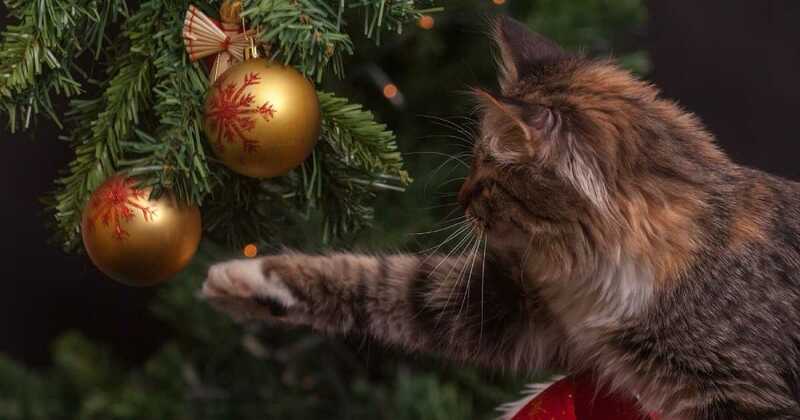 If you read further, we will help clarify what you need to look out for in a cat window perch, where to place it and other factors to consider. We want your cat to enjoy doing all cat things and as such we have gathered ten best cat window perches that your feline will love. You cat will be spending a lot of time on any of the cat window perches below. 26” x 14” x 1.5"
27" x 11" x 6"
This is a cat window bed that is mounted and as such you don’t have to worry about using up space. You can mount it at an elevated level of your choice. The cat bed is easy to install because it does not require the use of tools. Use the industrial strength suction cups on a glass window or door of your choice where your cat can access sunshine and view its surroundings. This seat window cat bed is able to carry up to 50 pounds. The bed is shaped like a pillow, made with the polyester material. The pillow cover can be removed and washed in the washing machine. It has Velcro on both sides to reinforce the cover. 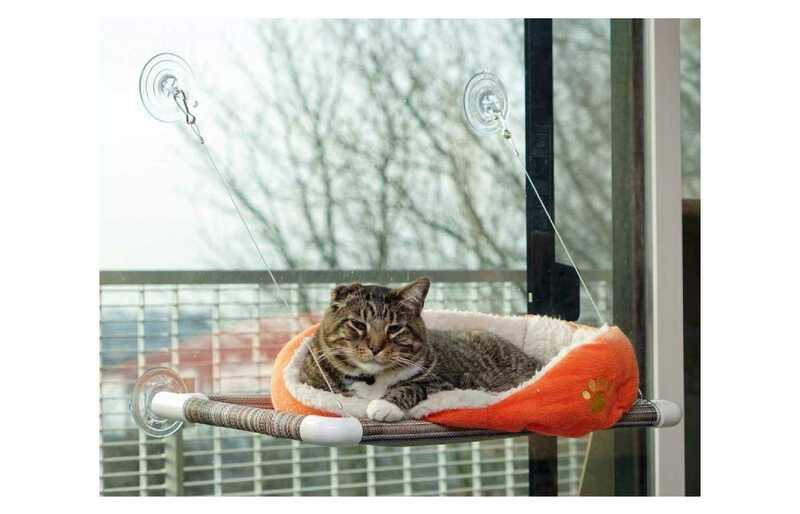 The support strings of the mounted window cat bed are 22 inches long. With the industrial strength of the bed, your cat can jump on and off without any accident. The purchase comes with four suction cups and a one-year warranty. 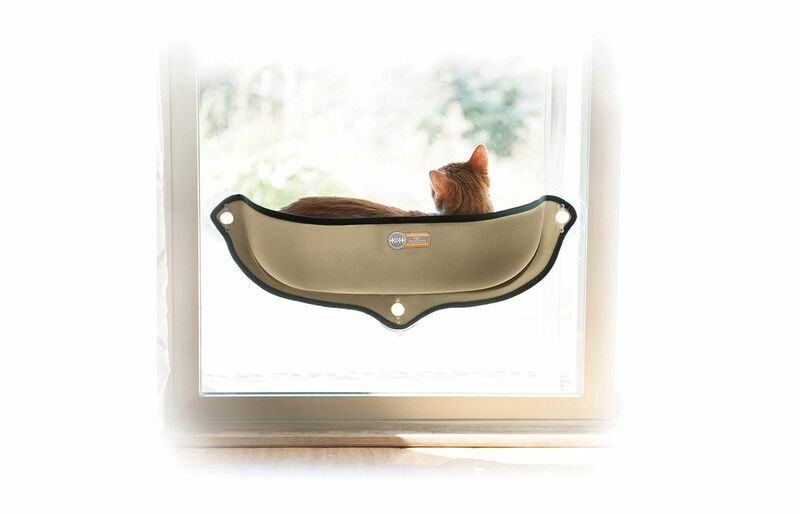 A sturdy, durable window cat bed made with steel and cotton. 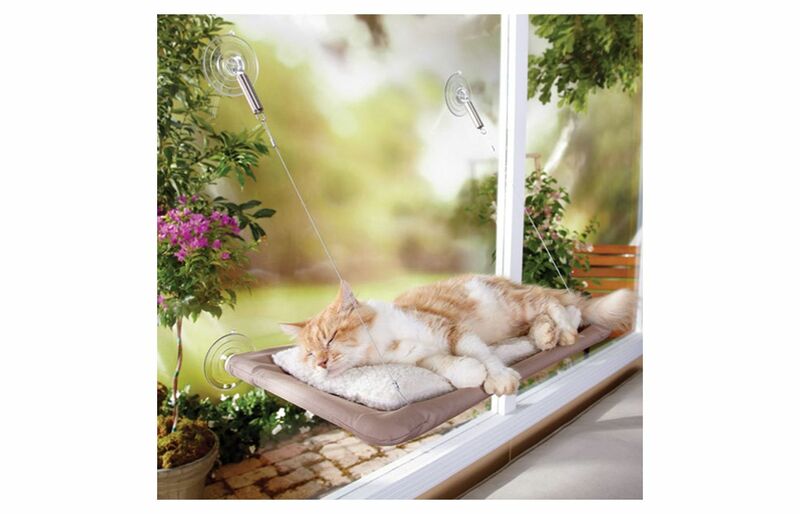 This is a double-decker cat window hammock which means it has two levels. Your cat can jump from one level to the other. 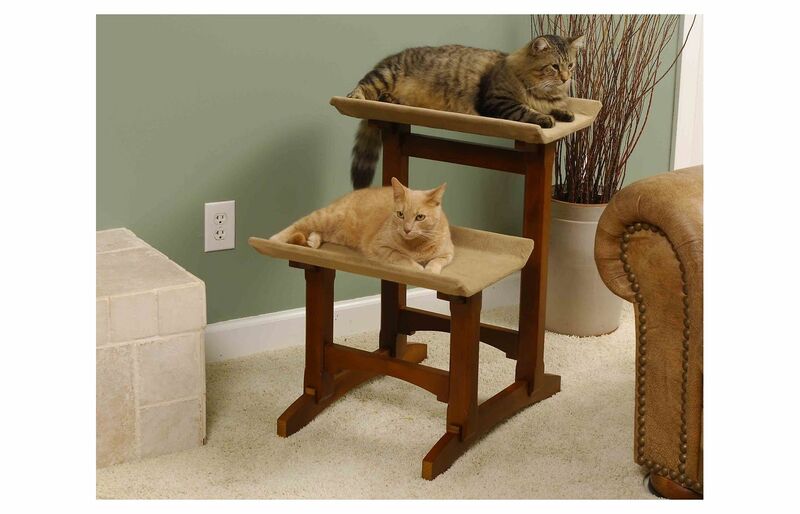 If you have two cats then this will be even more convenient. The window perch has a cat face metal frame that is strong and firm. The unique nut suction cups can hold a weight of up to 55 pounds. You can adjust the height between the two levels by moving the suction cups from 13.4 inches, 12.6 inches, and 11.8 inches. The suction cups can be used only on glass windows of a minimum width of 17.7 inches. This grey cat window perch has a removable plush mattress which can be washed with the machine. The purchase comes with an 18-month limited warranty. There is a manual with the assembling instruction included. Instructions should be followed strictly. 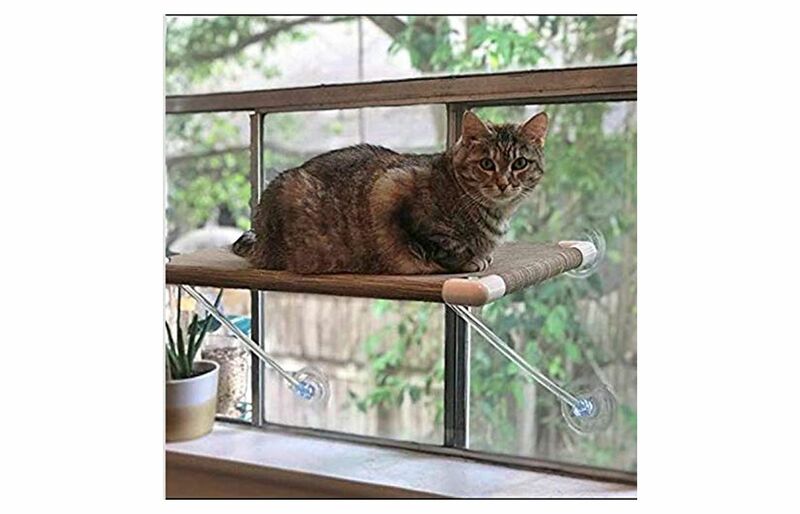 Unlike some cat window perch that use suction cups, this kitty sill uses a mounting adhesive of Velcro or screws If you have a window that is made of window panes or too small to hold a suction cup, then this is the best product for you. This Thermo-kitty Sill can be affixed to your windowsill temporarily using Velcro. If you want a permanent installation then you can use the screws. Furthermore, your cat can still enjoy heat even if you live in a cold climate. The thermos-kitty window perch is fitted with a heating pad that works with a thermostat. The heater uses 6-watts only which is energy efficient. Simply connect to a power source using the long 5.5 inches cord. Your cat will feel a pleasant warmth that is controlled to its body temperature. 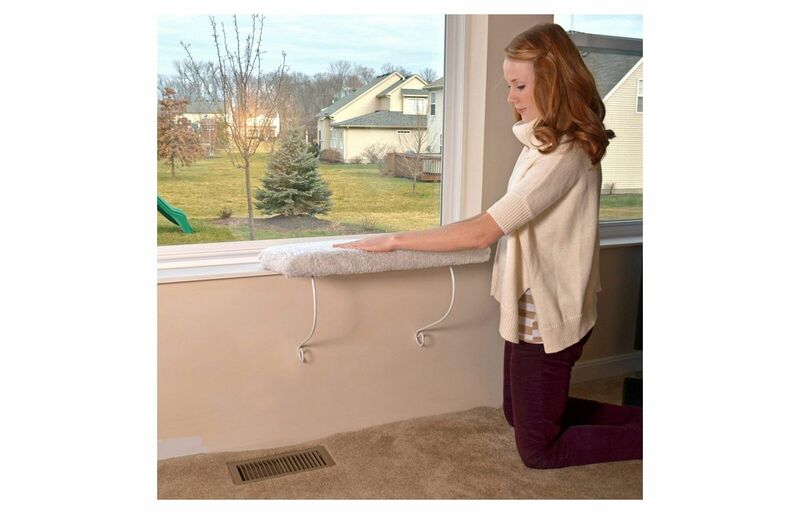 This cat window shelf is oval in shape and covered in fleece.Cleaning is easy, just remove the fleece cover, run on gentle cold cycle and air dry. This durable kitty window perch with big patented suction cups is indeed an original cat perch. It is a versatile cat perch as it can be used both indoors and outdoors. It is fitted with a hammock made of a tough weather-resistant fabric. The frame is made up of a lightweight PVC material. Your cat can sunbath with pleasure as you can mount it in its favorite spot. The cat window perch can hold a weight of about 25 pounds. Catnaps on this cat perch can be made more comfortable by placing your cat’s bed or favorite blanket on top of the hammock. It requires no tools for installation. The cot can be cleaned with a scrub brush and hose or washed in the bathtub. Ensure that the suction cups have properly adhered to the glass surface. You can place the cat window perch at any level that is desirable to you and your cat. This is a neatly designed window cat perch with no hanging wire that your cat can get entangled with while jumping or playing. It has attractive acrylic rods instead of wires.The cat perch is well made and has no visible suction cup showing which makes it blend in with any type of interior décor you have. This is because the suction cups are transparent. The fabric used is a non-sagging, tight fabric that can withstand harsh weather elements. All the parts of the frame have been pre-assembled and glued together which makes it even more durable and firm in the course of its lifespan. It is designed with a thick wall tubing, you don’t have to worry about the frame bending over time. The cat window perch can be affixed on windows that are at least 24 inches wide. You can mount the cat window shelf at any height but it should be at least 11 inches above the window base. If you have a cat that is shy and reserved, who still loves to bird watch or sight see but is anxious about been attacked by real or imagined predators. You can calm her fears by getting this cat window perch. This cat perch performs a 2 in 1 function. It serves as a house and a window perch. 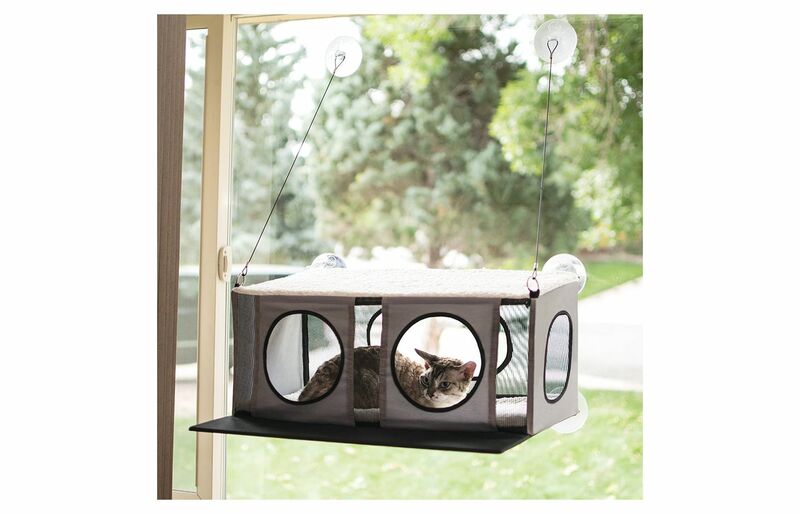 The enclosed design has a built-in ledge making it easy for your cat to enter and exit the window perch. At the same time, your cat is protected within and can see through the window via mesh windows. Your cat can lounge conveniently as the window penthouse is also lined with micro fleece. The house attaches securely to any preferred window using proven suction cups. With your purchase, you get a removable micro fleece pad. It is advisable to clean suction cups once a month to ensure optimal strength. The minimum window space needed is 24 x 30 inches. If you have another cat that wants to share, he/she can lounge on the top of the windows perch penthouse. As the name implies,your cat can be lazy all day while sunbathing by the window on this Lazy pet Deluxe Cat window perch. This window perch is comfortable and cozy because of the supportive orthopedic foam used in its design. It is covered with a soft cover that can be removed and washed at will. There is no tool required to fix this cat shelf. It has fastening strips that adhere the perch to your window sill.There are two size options available that will meet the need of either one cat or multiple cats. You can choose colors that fit into your interior or one that stands out. The pack contains the perch base, a piece of adhesive Velcro, 2 legs, 4 thumb screw located on the board, 4 washers as well. Also, an extra fleece cover was included as a bonus. It is recommended you allow the perch to sit for 8 hours after installing before applying weight on it. Do you have long to have your cat use beautiful window cat perch but you have no large glass windows? If the windows you have do not fit the requirement to use suction cups on them,look no further. This Tabby Napper Cat Window Perch was designed for double hung and casement windows. It has metal clips that can be fitted in between the window sill and the window sash. This design allows you the freedom to move the cat window perch from one window to another. In addition, your window can be open and your cat can enjoy the fresh breeze with you. The bed is large enough to hold two medium-sized cats. The cradle is soft,comfortable but firm, able to hold a weight of up to 60 pounds. It is easy to install since it requires no tools. You don’t have to worry about damaging your walls. There are no hooks, loop tape, suction cups or hardware involved. This is a cat shelf that was designed cats that weigh up to 60 lbs. A kitten can start using this cat window perch to start practicing her climbing skills and overcome any fear of height. Your kitten can learn about her environment and nature while staring out the window. This cat perch has three suction cups that can be used on windows, glass doors, smooth ceramics, and even mirrors. 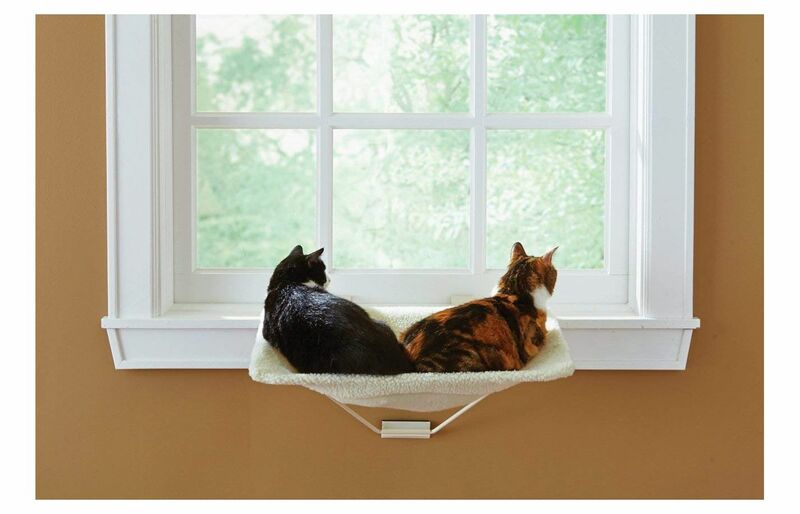 Here is a window perch made of the Amazin Kitty Pad to keep your cat comfortable. A window of 30 by 14 inches minimum will accommodate this window cat perch. If you love good quality furniture, then you would love this cat seat furniture. It is well made and has double seats that your cat can perch on. You can place the furniture near the window so that your cat can enjoy watching the world do its thing. It may be ideal for two or more cats. 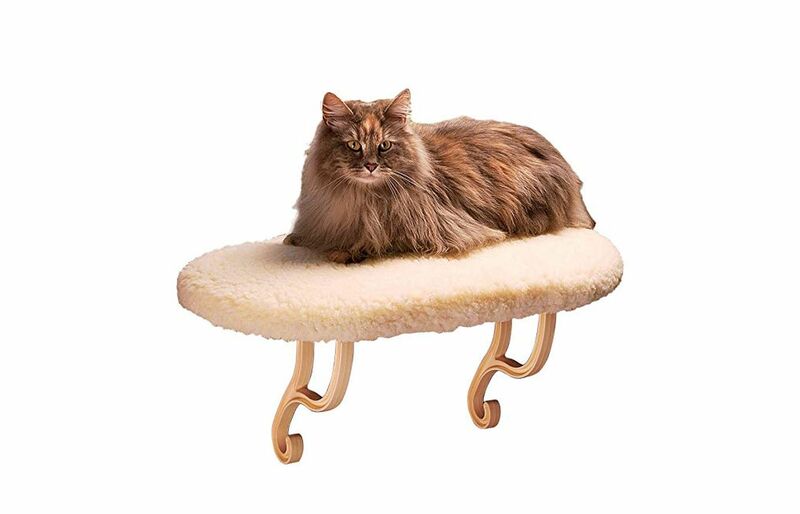 Each cat seat is made of durable microfiber fabric.The cat perch is easy to assemble and with its mahogany color, it will surely fit in your furniture at home. Furthermore, the seats are of varying heights. The lower perch is 17 inches tall and the top perch is 27 inches tall. The base has built-in felt pads that will protect your floor or tiles from scratches. You can opt for one seat if you prefer. You can polish the hardwood with furniture polish. The fabric can be cleaned with upholstery cleaner. For further maintenance, you can spot clean with a damp cloth. Why do I need a cat window perch? Your cat needs a window cat perch to keep a healthy mind. Although most cats spend 90% of their time indoors, a window cat perch gives them an opportunity to be involved in the outdoor activities going on around them. Cats are not interested in the latest sitcom or blockbuster drama but the squirrels and lizards climbing the trees will interest them. Also, having a window cat perch keeps your cat from boredom. Bored cats do destructive things, like scratch the furniture, destroy the carpet or meow ceaselessly. It also provides a safe haven for your cat far away from the hostile household pets. Here they can have some quiet and freedom. Finally, a window cat perch if well positioned can be a spot where your cat can sunbath and nap while he spends a lazy afternoon. How do I get the suction cups to adhere? Soak the cups a few minutes in warm water, this is to make them soft and pliable. Ensure the glass surface and suction cups are dry before bringing them in contact with each other. Press the suction cups hard on the glass and confirm that it is firm before putting any weight on them. Every month, clean the suction cups so that they can last longer. Why you should do if your cat drinks coffee right now? to earn fees by linking to Amazon.com and affiliated sites. © 2018 PurrfectKittyCat. All Rights Reserved.